COLUMBIA, Mo 1/3/14 (Op Ed) -- More than any issue in recent weeks, the destruction of the trees at 802 W. Stewart Road has prompted readers to contact the Columbia Heart Beat. "Can you do a story about the owner who cut down all the old trees and created a wasteland in his front yard?" Sarah Grim asked. "I cannot drive on Stewart now, as it is too awful to see." "He didn't even cut them; he gouged and mutilated them," said Ruthie Moccia, who sent us the picture above (click for larger image). What's left of the trees, she said, "stands there mocking us. It's the most atrocious destructive thing I have ever seen." Discussions have sprouted across Facebook, too. Dory Colbert borrowed from Joni Mitchell's ode to paved paradise, Big Yellow Taxi: "They took all the trees, Put 'em in a tree museum." 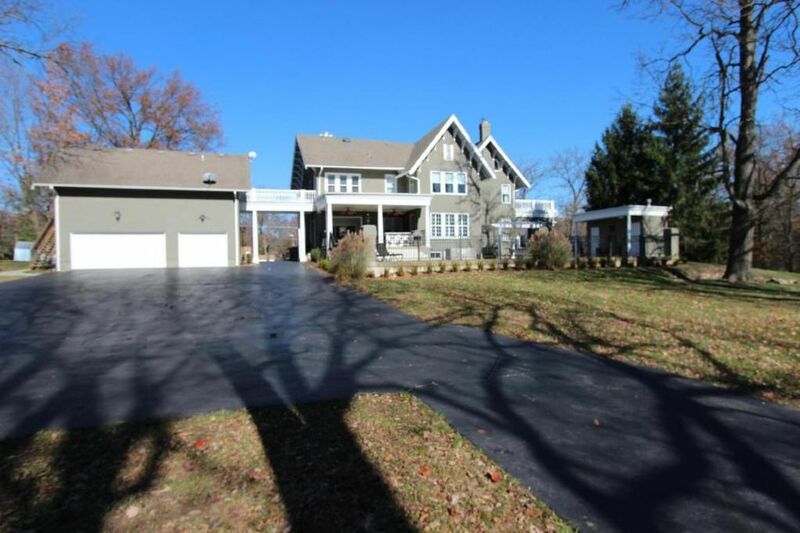 I've driven by the Old Southwest estate home that until recently belonged to the Harl family. I agree: it looks like a brontosaurus had lunch in the front yard, which is wide and prominent from the street. The story, however, falls outside our coverage guidelines. It's an issue of private property rights, a man's home is his castle sort of thing. But it's also an opportunity to explain our mission, why we cover some stories and not others, and what has motivated me to stick with a project that so far hasn't yielded a penny in profits. I started the Heart Beat in 2005 to cover and promote a renaissance in North Central Columbia, where I own and manage rental property. Around Columbia College, the area was recovering from decades of neglect. The Heart Beat takes its name from that original goal: covering the central city beat in the heart of CoMo. I was a newbie in urban revitalization, which has fascinated me since grade school. What I failed to realize until actually stepping into it was that urban decline has many causes. It's not just slumlords, drugs, and crime. Those are private sector problems that set in AFTER the decline starts, almost always at the hands of public officials, the very people I once thought would be most interested in preventing the terrible social problems that accompany urban decay. Poor planning, bad zoning, infrastructure neglect, unfair taxation, and in Columbia, segregation and the great property theft known as Land Clearance started the central city's decline. Plopping down acres of segregated public rental housing exacerbated it. In this, I saw a journalistic opportunity: cover local government, public officials, and policy making. Here change would stand a chance, through the political process. I hate to burst anyone's Tigertown bubbles, but government in Boone County and Columbia is pretty corrupt. Surprised me, too, because the corruption masquerades as boosterism, burying its claws in clever disguises, from non-profit charity work to Democratic Party ideals to building overpriced schools "for the children." These disguises are part of what makes corruption so entrenched and difficult to eradicate. The best measure of corruption's impact lies in the rich/not rich divide. Has local government made the not-rich -- from the low to upper middle income -- any better off than they were 10 years ago? Are their taxes, rates, and fees lower? Are their personal balance sheets much improved via City Hall, County Hall, or the School District? (And by "much improved," I mean improved by hundreds of thousands if not millions of dollars). Ask that same question about wealthy residents like Stan Kroenke, Bob Pugh, Tom Atkins, Bruce Odle, Hank Waters, and so forth. In the answer, you find the divide government corruption hath wrought. It makes sense that we'd be interested in the trees on Stewart. That we'd interview the owner, find out the who, what, why, and how behind that brontosaurus feast. We've done several stories about trees in jeopardy, including our recent 5-part series Stumped with photojournalist Matthew Schacht, (which I'm pleased to note is under consideration for a Hillman Prize in Public Service Journalism). But the trees at 802 are on private property. There's no rezoning afoot; no widening of Stewart Road; no tax dollars spent taking them down; no apparent intersection with City Hall. It's tragic on one level, certainly. But on another level, those toppled trees remind that we still have private property rights. We can still do pretty much what we want with our stuff, so long as it's not depriving someone else of their rights. At the same time, blight, land clearance, eminent domain, rezoning North Village residents out of their homes, and Constitutional problems with City Hall's rental laws remind that property rights -- like trees -- can be taken away, almost with the speed of a falling ax. GLASCOCK TO LEAD OLD SW TREE REMOVAL: But will trust issues create roadblocks? STUMPED: Can the economy and the environment coexist in CoMo? STUMPED: Can CoMo put a price tag on lost trees? STUMPED: Does a grim future await Columbia's trees? 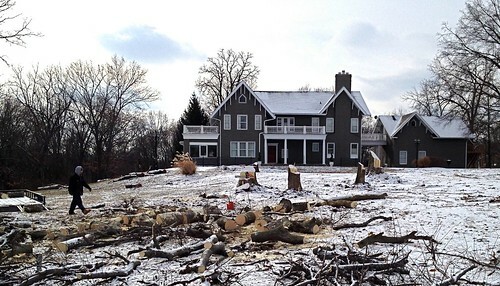 STUMPED: Can land excavation and tree preservation be a win-win for CoMo?